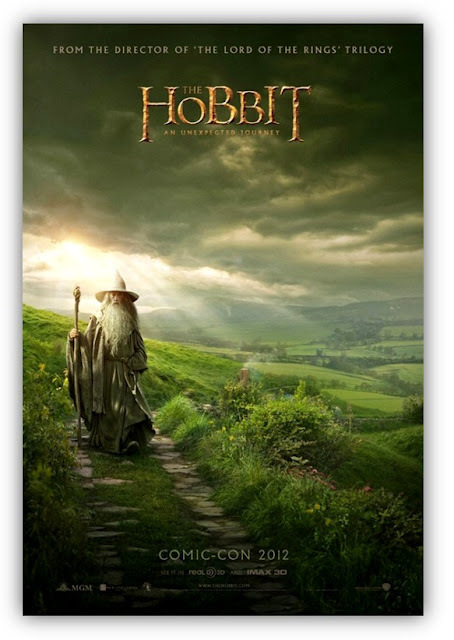 Check out Gandalf (Ian McKellan) walking through The Shire in this new poster from Peter Jackson's THE HOBBIT: AN UNEXPECTED JOURNEY. The poster is making its debut at Comic-Con 2012 (July 12 - 15 in San Diego). Does that image bring you back to LORD OF THE RINGS or what? The Shire reminds me of a little of the Annapolis Valley in Nova Scotia where I was raised for a good portion of my life. The Shire always brings a smile to my face whenever I see it. Have to get to New Zealand one of these days! And what a gorgeous shot! The cinematography is going to be amazing once again isn't it? Especially when you add in glorious 3D! The movie is being shot with Red Epics in 48 frames per second on 3ality Technica 3D rigs. THE HOBBIT: AN UNEXPECTED JOURNEY follows title character Bilbo Baggins, who is swept into an epic quest to reclaim the lost Dwarf Kingdom of Erebor, which was long ago conquered by the dragon Smaug. Approached out of the blue by the wizard Gandalf the Grey, Bilbo finds himself joining a company of thirteen dwarves led by the legendary warrior Thorin Oakenshield. Their journey will take them into the Wild; through treacherous lands swarming with Goblins and Orcs, deadly Wargs and Giant Spiders, Shapeshifters and Sorcerers. Although their goal lies to the East and the wastelands of the Lonely Mountain, first they must escape the goblin tunnels, where Bilbo meets the creature that will change his life forever… Gollum. Here, alone with Gollum, on the shores of an underground lake, the unassuming Bilbo Baggins not only discovers depths of guile and courage that surprise even him, he also gains possession of Gollum’s “precious” ring that holds unexpected and useful qualities… A simple, gold ring that is tied to the fate of all Middle-earth in ways Bilbo cannot begin to know.